↑ "Largest religious structure". Guiness World Record. ↑ Ashley M. Richter (सितंबर 8, 2009). 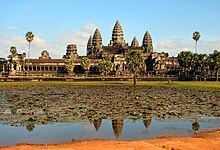 "Recycling Monuments: The Hinduism/Buddhism Switch at Angkor". CyArk. पहुँचतिथी 6 जनवरी 2016. ↑ "Government ::Cambodia". CIA World Factbook.